In last week’s outlook we warned for a December dip in stock markets. The market has showed some weakness already, but Friday’s surge recovered most of the losses. Unfortunately, that hasn’t really improved the technical picture. 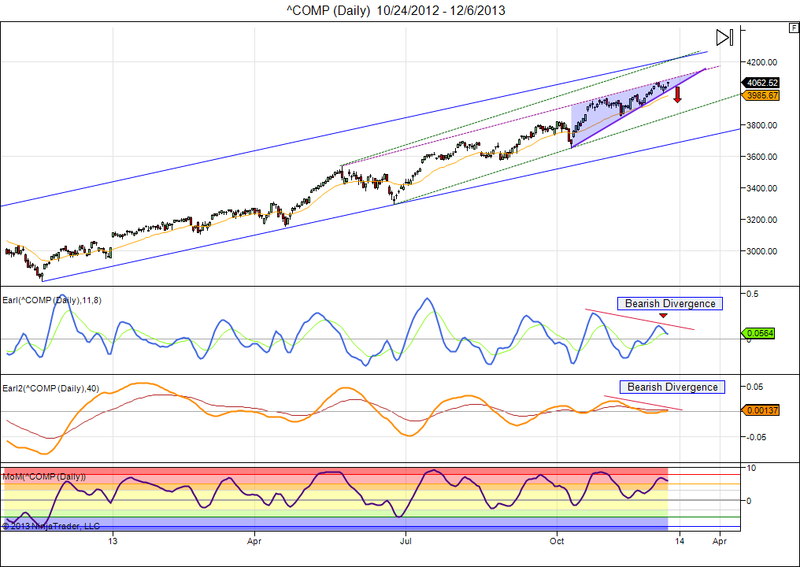 The chart is very similar to the S&P chart we presented last week. The Nasdaq is in a rising wedge with bearish divergences in my Earl indicators, suggesting that the next move is more likely to be down than up. Our key reversal levels also show a weakening picture for most stock indexes. And we remain in lunar red period, so the downside risk is bigger than the upside potential at this point. I don’t see any good reason to buy. So, wait and see is the place to be. This entry was posted on December 9, 2013 at 2:26 pm	and is filed under Financial Astrology, Market Commentary. Tagged: lunar cycles, Nasdaq. You can follow any responses to this entry through the RSS 2.0 feed. You can leave a response, or trackback from your own site.